With a stay at 1 Park Row B&B, you'll be centrally located in Farnham, within a 5-minute drive of Farnham Castle and New Ashgate Gallery. 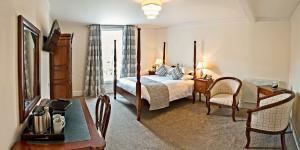 This bed & breakfast is 10.2 mi (16.4 km) from University of Surrey and 0.6 mi (1 km) from St Andrew's Church. When would you like to stay at 1 Park Row B&B ? If you arrive at the property after hours, you'll need to check in at an alternate location: Restaurant. Each day we'll check prices and send you an email for your selected dates at 1 Park Row B&B. If you don't have specific dates but would like to check prices for say next weekend or say next month we can check the price too. Click to write a review and share your experience of 1 Park Row B&B with other travellers.